TOFU MOM . . . and gravy! : Do Buffalo Tofoos have Wings? Do Buffalo Tofoos have Wings? OK, it may not be the hit of the "traditional" Superbowl crowd, but they don't know what they're missing. These babies get INHALED at our house. My kids used to LOVE those awful "real" Hot Wings. Blame their Dad. Probably one of the last non-veg items they gave up. We tried a couple of the commercially prepared "Veggie-Chik Hot Wing" style thingies, but nothing was even close to that buttery, vinegar-y hot- sauce-coated dead bird that they loved. Many failed experiments later... We now have something approximating those hot wings. I'm not saying these are exactly the same, we all know "exact" comparisons tend to be disappointing, but my family loves these (even the tofu-skeptic teens) so they must hit the spot somehow. I have a technical problem calling them "wings" because really, to my knowledge, tofu does not have wings, but call them whatever you like. Now, a Mom-Note: Buffalo Tofu strips/wings/things tend to be messy eating. We've discovered though, that they make awesome "wrap" type sandwiches in flat-bread, pita or just plain tortillas. Your call. 1 block extra firm tofu, pressed and drained (just to get some of the excess liquid out, doesn't have to be for too long) and frozen, then thawed. This doesn't have to be made with frozen-thawed tofu, but the texture is better. We've done it both ways. Cut tofu into strips or fingers. Heat 2 Tbsp. oil (I much prefer coconut oil here) in a non-stick skillet, to medium high. 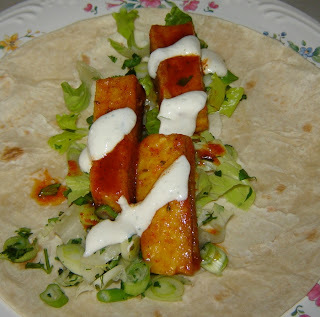 Roll tofu strips in the spice-breading mixture, carefully shake of excess. Place strips carefully in the hot oil. They should start to brown and crisp in a minute or two. Carefully turn with tongs or turner. Brown on all sides. Gently toss strips in marinade until coated. Remove to serving plate (if hungry munchkins haven't started picking them out of the bowl already). Serve with vegan ranch-style dip or make into a "wrap" or sandwich for less messy eating. I love the title of your post! That looks delicious. The marinade sounds so good, I have to try it out. Those look yummy. And so much simpler than the seitan buffalo wings my boyfriend keeps making. I don't know why I never thought to use tofu instead... maybe because I have only recently figured out how to fry it. Those sound HOT an delish! DH is going to enjoy this recipe! The hubster would like your version. I wonder if I could adapt that to make mild wings for the rest of us. This is the one of things that my family craves. I haven't been able to find a replacement until now. I cannot wait to make it. Thanks, great recipe! Just made it, delicious! Have you tried it w baked tofu? I'm marinating some tofu overnight now.. I'll try it that way tomorrow. Thanks for the recipe! I made the marinate and it is delicious! I added extra hot sauce and it's awesome! Thank you so much for posting this recipe! It's terrific! I just made them and they are wonderful.